The magnificent central Nepal valley of pokhara lies nestled beneath the splendid Annapurna range, home to some of the most beautiful snow-capped mountain peaks of Nepal. It is situated about 200 kilometers/125 miles west of Kathmandu and is the second most popular tourist destination in Nepal. 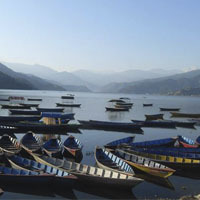 Stretched out on one side is the Phewa Lake while to the north lays the splendid 140-kilometer Himalayan Panorama including the famed Machhapuchhre (the Fish Tail). A perfect blend of fascinating mountains, beautiful lakes, artistic and sacred temples, Inquisitive caves and exciting spots like Sarangkot attract people from all around the world to enjoy a relaxing holiday in this "Lake City of Nepal". Widely acknowledged as one of the best national parks in Asia, the Royal Chitwan National Park, with an area of 932 square kilometers is the oldest national park in the kingdom. It is located about 150 kilometers /94 miles southwest of kathmandu in the subtropical lowlands of Nepal and is a World Heritage Site since 1984. A good population of the most graceful Royal Bengal Tiger, the rare Greater One-horned Rhino, Wild Cattle/ Bison, Wild boars, Leopard, Wild Elephant, different species of Deer, Crocodiles, Python, Striped Hyena, Pangolin and more than 500 species of birds make Chitwan a wildlife Paradise. Elephant Safaris, Canoe Rides, Jungle Drives, Hikes, Round-table Discussions, Slide Lectures and Tours to the Ethnic Villages add to the charm of staying in the Deluxe Wildlife Resorts amidst the tranquility of the nature. 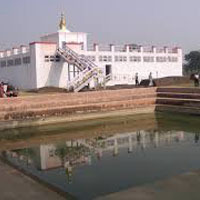 Lumbini is the symbol of peace for all humanities and is the most Holy ground for the whole Buddhist world. Queen Maya Devi gave birth to prince Siddhartha at this place in 623 BC, who later on became the Buddha. The first major Buddhist ruler of India, Emperor Ashoka erected a pillar In 249 BC to commemorate his visit to this holy place. Now it stands proudly right in front of the Mayadevi Temple as a historical monument. The Maya Devi Temple has a stone image of Maya Devi giving birth to Lord Buddha as she holds onto a branch. Excavations have turned up a stone bearing a "foot print" indicating the exact place of birth. Adjacent to the Mayadevi temple is a sacred pond called "Pushkarni Pond" where Queen Maya Devi is said to have bathed and Prince Siddhartha was given his first purification bath after his birth. Around an hour's drive northwest from Lumbini lies the interesting archeologically important site of TILAURAKOT. This has been identified as the ancient Kapilvastu, the capital of King Suddodhana, Buddha's father, and where the Buddha himself as Prince Siddhartha spent the first 29 years of his life. Lumbini Museum, Kapilvastu Museum, Lumbini Library (containing some 12,000 books on religion, philosophy, art and architecture) and the artistic temples/monasteries (built by different nations like China, Japan, Thailand, Myanmar and others) glorify your trip to Lumbini. Royal Bardia National Park is the most undisturbed and the largest wilderness area in the terai lowlands of Nepal. It is densely covered by Sal forests, riverine forests & grassland and is a perfect habitat for endangered animals like Wild Elephant, Greater One-horned Rhinoceros, Black Buck, the Gangetic Dolphin, Gharial Crocodile and the exclusive Royal Bengal Tiger. More than 360 species of birds including the endangered Bengal Florican, Sarus Crane, Silver-eared Mesia and the Lesser Florican are found in the park. Royal Bardia National Park can be reached by a short flight (50 minutes) from Kathmandu to Nepalganj followed by a drive of about 3 hours or by surface (about 11 hours from Kathmandu, 8 hours from Chitwan and 3 hours from Mahendra Nagar - Royal Shuklaphanta National Park). A trip to Bardia National Park is best combined with rafting in the thrilling Karnali river with or without trekking and / or Shuklaphanta and Chitwan. 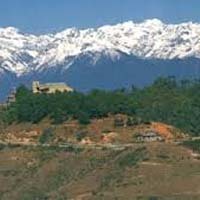 The Royal Shuklaphanta Wildlife Reserve - situated in the southern part of Far-western Nepal at an elevation of 90 to 270 meters above sea level, is very close to the Gaddachowki Entry Point on Nepal-India border. 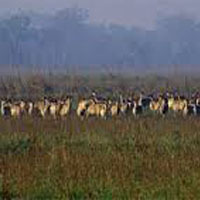 The phantas - plains with tall grasses and forests provide the best habitat for the Swamp Deer, which can be seen in large herds - probably the largest in the world. Other wild animals in this tiny reserve (just 305 square kilometers) include wild Boar, Wild Elephant(40 - 45), Rhinoceros, Blue Bull, Leopard, Hog Deer, Hispid Hare, over 300 species of Resident and migratory Birds and the most sought after Royal Bengal Tiger(30-35)! Tours to Shuklaphanta are best combined with the Corbett National Park, Dudhwa National Park, Nainital, Delhi or other destinations in India; or with Bardia, Lumbini and / or Chitwan in Nepal. 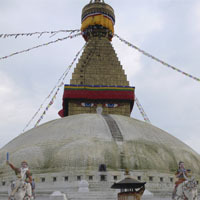 The best time to visit Shuklaphanta is from October to April. One can fly from Kathmandu to Mahendra Nagar or to Dhangadhi in the far west followed by a short drive to the reserve or, can reach to the same by surface. Elephant Safaris, Jeep Drives and Walks provide the best game-viewing opportunities in Shuklaphanta. 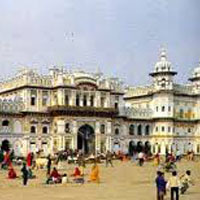 Janakpur was the capital of the ancient kingdom of Mithila, which existed around 700 BC. It stands out as the cleanest and the most attractive towns of the terai and is named after the legendary king Janak. The most sacred sites are the Janaki Temple dedicated to Sita; the Ram Sita Bibaha Mandir built over the spot where Ram and Sita were married, Ram Mandir dedicated to Lord Ram and the holy pond Dhanush Sagar. Janakpur is thronged by thousands of pilgrims and other visitors throughout the year and especially during the festival of Bibaha Panchami (The annual festival to Celebrate the marriage of Sita and Ram when the whole city is enlivened by the wedding festivities for a whole week). Janakpur is also the center of the Mithila arts and crafts in Nepal. A number of good hotels in this sacred city will make your stay comfortable and enjoyable. You can best combine Janakpur with Safari tours in the Royal Chitwan National Park or in the Koshi Tappu Wildlife Reserve. 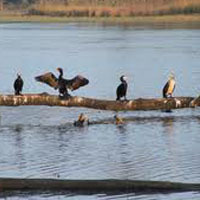 Koshi Tappu Wildlife Reserve is situated in the embankments of the Sapta Koshi river system in eastern Nepal. It covers an area of 175 square kilometers and is the only place for the last surviving population of Wild Water Buffaloes in Nepal. Spotted and Hog Deer, Wild Boar, Blue Bull, the endangered Gharial Crocodile, Gangetic Dolphin and more than 439 species of Birds have been recorded here. Koshi Tappu is proud to be the habitat for many species of birds not seen elsewhere in Nepal. Some 20 species of Ducks, 2 species of Ibises, many Storks, Egrets, Herons and the Endangered Swamp Partridges & Bengal Florican quench the thirst of the bird watchers at Koshi Tappu. 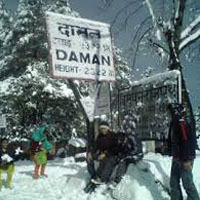 Daman is a hilltop popular for the view of the world's highest peak - Mount Everest. It is only 80 km away from Kathmandu but you will need to drive for about four hours because of the mountain highway. However, the drive through the scenic landscape and villages is quite enjoyable. You can have luxurious accommodation and cuisine of international standard at Daman. Your visit to this tranquil place far away from the effects of mass tourism can be best combined with Wildlife Safari Tours in Chitwan or Koshi Tappu. 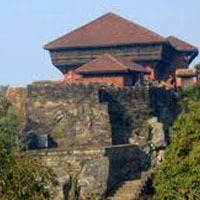 Nuwakot is interesting to the lovers of Nepalese history and to the trekkers too. 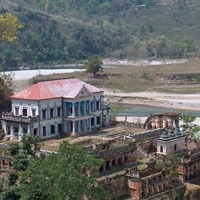 You can see a wonderful palace of Great King Prithvi Narayan Shah, the founding father of Modern Nepal. The hilltop of Nuwakot is one of the best spots for watching the terrific Himalayan panorama. You can trek from here to Langtang National Park area and beyond. Muktinath is situated at an altitude of 3800 meters /12500 feet above sea level in Mustang district on the northern arc of the Annapurna circuit trekking trail. It is held sacred by both Hindus and Buddhists. Set around the main temple of Lord Vishnu is 108 waterspouts. The Jwala Mai temple nearby contains a spring and an eternal flame fed by natural gas spewing out of the ground. Jomsom (2713 meters/8900 feet) is another popular tourist destination in the area just about 18 kilometers/ 11 miles southwest of Muktinath. 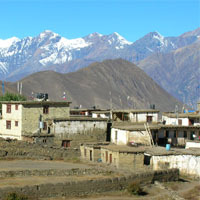 You may fly to Jomsom directly from Kathmandu, Pokhara, or trek to the area. Pony Rides are the alternatives between Muktinath and Jomsom or vice-versa. Gorkha is a scenic and historical hill town lying almost midway between Kathmandu and Pokhara. King Prithvi Narayan Shah the Great, the founding father of Modern Nepal was born here. It was from this very place that the King began his campaign to unify all the then small kingdoms formulating the present kingdom of Nepal. Situated on a hill overlooking the snowy Himalayan peaks is the beautiful Gorkha Durbar, a fort and an artistic temple complex built in the 16th century. Treks to the Manasalu Region start from Gorkha and treks to the Annapurna Circuit can be started from here too. 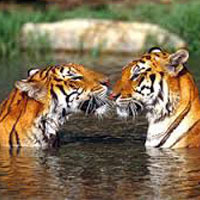 Gorkha is also best combined with wildlife safari tours in the Royal Chitwan National Park. ((123 kilometers/77 Miles south of Pokhara) Located on the Siwalik Mountains - the youngest mountains in this region, it offers an ultra-wide Himalayan panorama ranging from Dhaulagiri in the west to Gauri Shankar in the east! Looking downhill, one has a sweeping view of the Tinau River valley, the Churia range and the Terai flat lands. The breathtaking views are accompanied by the ancient culture, friendly and welcoming smiles of the local people and the peaceful atmosphere- all perfectly blended. You can combine your trip to this pristine destination with Pokhara, Lumbini- the Birthplace of Lord Buddha, With Gorkha and/or with the wildlife safaris in the national parks down in the lowlands.